Peroxide Formers: Oxygenated organic compounds that react with atmospheric oxygen to form explosive peroxides. Examples commonly found in our labs include: sodium amide, diethyl ether, dioxane, THF, and benzyl alcohol. Polynitrated Aromatics: Compounds which have reactive nitrate groups that can form explosive picrate salts when exposed to certain metals. Examples include: dinitrotoluene, dinitrophenol, hexanitrostilbene, and nitroglycerin. Shock-Sensitive Chemicals: Any chemical that could detonate due to heat, friction, and/or shock. Examples include: picric acid, hydrazine, ammonium nitrate, and perchloric acid. Chloroform: Reacts with air over time to form phosgene – a deadly, odorless gas. Anhydrous HF: Easily liquefies and can react with a carbon steel container in the presence of moisture to form hydrogen and iron fluoride. This can cause an increase in pressure inside the cylinder due to the hydrogen gas buildup over time. Peroxide Formers may be characterized by having a mossy look around the cap. There may be a white film or residue around the neck, threads or cap of the container or there may be crystals in the liquid. For solid peroxide formers, there may be discoloration or the formation of a surface crust. Polynitrated Aromatics which have dehydrated will be pale in color and crystals may be present. Chloroform will have a normal appearance. The only way to determine stability is by the age of the material. Anhydrous HF cylinders may show a build-up of pressure in the regulator of the cylinder. Peroxide test strips, which turn to an indicative color in the presence of peroxides, are available commercially. These strips must be air-dried until the solvent evaporates and then exposed to moisture for proper operation. To use most of these, simply dip the strip in the suspect material and then compare the color on the strip to the calibration chart that comes with the test kit. This gives a quantitative peroxide concentration, usually in parts per million (ppm). Anything above 50ppm should not be handled. The EH&S office should be notified immediately (254-710-2900). Caution: these strips have finite ranges. Read the product information or call the manufacturer for more info. Make sure you purchase material that contains an appropriate peroxide inhibitor or stabilizer, such as butylated hydroxytoluene (BHT) or ethanol. If you must store non-inhibited material, be sure to store the material under an inert atmosphere of nitrogen or argon and test it for peroxides at least once a month. Do not distill, evaporate or concentrate the material until you have first tested the material for the presence of peroxides. Peroxides are usually less volatile than their parent material and tend to concentrate in the (hot) distillation pot. Do not use a metal spatula when working with any peroxide formers. NOTE: Never, under any circumstances, touch or attempt to open a container of peroxide-forming liquid if there are whitish crystals around the cap and/or in the bottle. 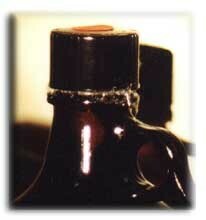 The friction of unscrewing the cap could detonate the bottle and cause severe injury. Picric acid and its derivatives should be stored in small quantities, within the original container, and in a cool, dry, well-ventilated area, that is away from sources of heat. Picric acid is considered a flammable solid and is incompatible with oxidizers, reducing agents, inorganic salts, metals, alkaloids and albumin. Improperly managed or stored picric acid may become sensitive to shock, friction, and heat. Picric acid allowed to dry out to less than 10% water by volume, becomes unstable and may pose an explosion hazard in your laboratory. If the material appears dry, do not open or handle the container – immediately contact the EH&S Office: 254-710-2900. Picric Acid should be monitored for water content every three months. The material should look like a wet paste. Dispose of unused picric acid as hazardous waste within two years of receipt. Do not use a metal spatula when working with any polynitrated aromatics. Materials listed as being shock sensitive or explosive should not be stored for prolonged periods of time. They should be stored away from reducing agents, flammable and combustible materials, and away from dehydrating agents. Shock-sensitive materials should be stored in a cool, dry area, and protected from heat, shock, and friction. Chloroform should be stored in a cool, dry, well-ventilated area [less than 30 degrees ˚C (86 degrees ˚F)] and in tightly sealed containers. Chloroform decomposes at normal temperatures in sunlight in the absence of air, and in the dark in the presence of air. Phosgene is a decomposition product of chloroform. Phosgene exposure can cause damage to the central nervous system, and can be fatal. If possible, chloroform that is stabilized with alcohol should be purchased. If non-stabilized chloroform is necessary for the work, it needs to be treated like a peroxide forming compounds and be used up or disposed in a short amount of time. Amylene is also used as a stabilizer, but there is evidence that it may not prevent phosgene generation. If you find unstabilized chloroform older than one year, it should be immediately disposed as hazardous waste. Stabilized chloroform should be disposed of after it has been open for longer than one year. Compressed gases such as hydrogen fluoride, hydrogen bromide, hydrogen sulfide, hydrogen cyanide, and hydrogen chloride (all anhydrous forms) have a short shelf-life provided by the manufacturer which must be strictly adhered to. Gases such as hydrogen fluoride and hydrogen bromide may react with the metal walls of the cylinders to produce hydrogen. The gaseous hydrogen collects in the vapor space and builds pressure over an extended period of time. In order to minimize the possibility that the pressure would build to unsafe levels, cylinders should be pressure checked with a suitable pressure gauge during the manufacturer’s recommended maximum shelf life period (usually 2 years or less). Cylinders should be returned to the supplier after that time or if they are not being used. Corrosive gases can also increase hazards over time. Corrosives can damage valves so they cannot be fully opened or closed. Valves on corrosive gases should be closed when not in use. A First In First Out (FIFO) inventory rotation should be applied to any cylinders that you may be using in your laboratory. The potential exists for pressure increases of several hundred pounds to occur during the recommended storage time frame of Anhydrous HF. Pressures may continue to rise over longer storage periods. If you discover any HF cylinders that have been in storage longer than two years, immediately contact the EH&S Office: 254-710-2900. Laboratory personnel should be mindful of their time-sensitive chemicals and request pickups for any material that is expired or not needed. In addition, it is recommended practice to only order as much of these chemicals as will be reasonably used by their expiration dates. To assist the laboratory personnel with the management of their time-sensitive chemicals, the EH&S department does twice yearly checks of the Baylor Sciences Building inventory and will contact any laboratories that have material that has a date older than the recommended safe storage time. For laboratories outside of the Baylor Sciences Building, EH&S communicates directly with the laboratories to address any issues with inventory. If you need to request a waste pickup for your time-sensitive materials, please visit https://www.baylor.edu/ehs/index.php?id=93761 and follow the link to the Waste Pickup Form.